Prepare for your OCN® Exam with the only study guide endorsed by ONS! Based on the latest test blueprint for the OCN Exam, this is the only question-and-answer review developed in collaboration with the Oncology Nursing Society. Practice questions match the format and makeup of the OCN Exam and reflect important changes in cancer treatment and nursing care. 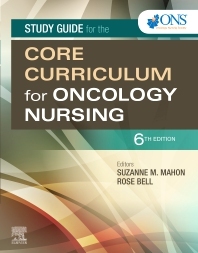 A companion to Core Curriculum for Oncology Nursing, 6th Edition, this definitive resource maximizes your study and review for OCN certification. UNIQUE! The only Q&A review book developed in collaboration with and endorsed by the Oncology Nursing Society (ONS), the parent company of the Oncology Nursing Certification Corporation (ONCC), which administers the OCN Examination. UNIQUE! In-depth review matches the ONS Core Curriculum for Oncology Nursing and reflects the full continuum of cancer care, the scientific basis for practice, palliation of symptoms, oncologic emergencies, and professional performance. UNIQUE! Questions keyed to QSEN (Quality and Safety Education for Nurses) competencies focus on reducing errors and increasing patient safety. Expert contributors include authors who developed the ONS Core Curriculum for Oncology Nursing, other cancer experts, and other practicing oncology nurses. Answer Key includes detailed rationales for correct and incorrect responses.